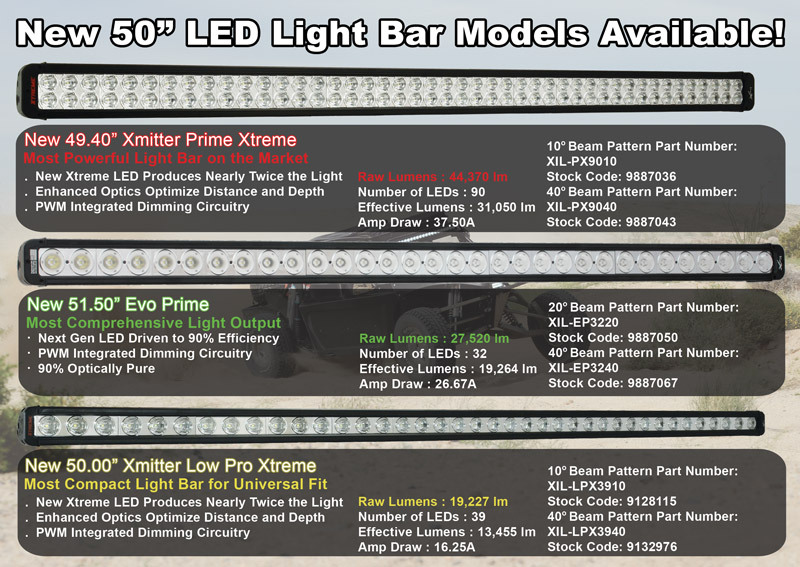 August 8th – Algona, WA – Vision X Lighting announces the upcoming availability of three new 50” LED light bar models in the Xmitter Prime Xtreme, Evo Prime, and Low Pro Xtreme series. 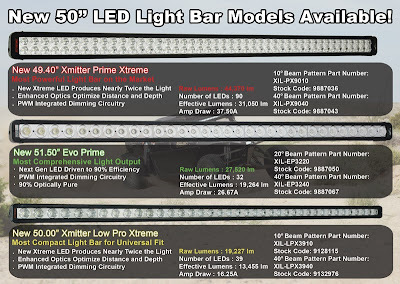 Vision X now has three choices for a 50” light bar in addition to the XIL-1000, all of which include a limited lifetime warranty. These bars will work perfectly mounted across the top of your truck, jeep or sand rail. No one else offers this much versatility in 50” light bars. The Xmitter Prime Xtreme is 50% brighter than any other light bar on the market, shinning bright with 44,370 raw lumens. The housing for all Vision X light bar series are made of rugged 6061 extruded aluminum to withstand harsh conditions, and provide incredibly efficient heat sinks to keep the LEDs running cool. All three of these light bars feature Prime Drive Technology which monitors the running temperature of the light and optimizes the light output to maintain desired operating temperature. This allows for the LED to last its 50,000 hour lifespan. New enhanced optics optimize distance and depth with an optical purity of 90%. Each model also uses a durable polycarbonate lens cover to protect the LEDs from rocks and other debris. Plus, every light bar comes with a weatherproof wiring harness with universal deutsch connector. The Xmitter Prime Xtreme series speaks for itself as the most powerful light bar on the market producing 44,370 raw lumens! It uses 5 Watt Xtreme LEDs to produce nearly twice the light output of the industry standard 3 Watt LEDs. The Xmitter Prime Xtreme is available in a 10° and 40° beam pattern. The Evo Prime offers the most comprehensive light output with 27,520 raw lumens. This allows for a greater flood pattern and intermediate spot beam pattern. This LED light bar also offers a unique look to the 3 Watt and 5 Watt bars. The Evo Prime is available in a 20° and 40° beam pattern. The Low Pro Xtreme is the perfect combination of performance and price with a 19,227 raw lumen output. It offers you the most lumens per dollar on the market. With its sleek 2” profile it can be used in numerous applications; from Jeeps to trucks to sand rails. The Low Pro Xtreme is available in a 10° and 40° beam pattern. XIL-PX9010 (Stock Code: 9887036): 49.40”, 90 LED, 10 Degree Beam Pattern, Xmitter Prime Xtreme, – $2,699.00. Available Now! XIL-LPX3910 (Stock Code: 9128115): 50.00”, 39 LED, 10 Degree Beam Pattern, Low Pro Xtreme, – $1,399.00. Available Now!